OUTSIDE DIMENSIONS (HxWxD): 59″ x 39″ x 24″ (Add 3″ for handle) INTERIOR DIMENSIONS (HxWxD): 55 ½” x 36″ x 17 ¾” INTERIOR CAPACITY: 23.70 Cubic Ft. USABLE INTERIOR CAPACITY: 20.52 Cubic Ft. MAXIMUM LONG GUN CAPACITY: 39 (11/11/11) AVERAGE RECOMMENDED LONG GUN CAPACITY: 30-33 WEIGHT: 687 lbs. 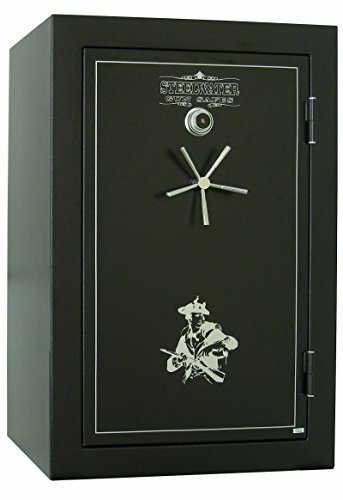 SAFE FEATURES 1 Hour of fire protection at 1875°F Maximum 39 (11/11/11) long gun capacity (Average Capacity: 30-33 long guns) 12 Gauge steel construction Composite constructed 5 1/8″ thick door. Door opening: Height: 49″ Width: 29″ Total of (18) 1 ½” diameter solid steel locking bolts, (11) chrome plated active bolts, with an additional (7) inactive bolts on the hinge side for a total of (4) sides of bolt coverage Gear driven lock and bolt system for added strength against drill attacks, punch attacks, and pry attacks. 8X Larger Drill/ballistic resistant hard plate to protect the lock, gear drive and vulnerable areas of the linkages from being drilled or manipulated Spring loaded re-locking bolt in case lock is removed during a burglary attack Semi-gloss textured powder coat finish and polished chrome 5-spoke handle Heat activated expandable door seal. (4) Pre-drilled ½” diameter anchor holes. Fully upholstered grey interior that features a three-section gun rack that can store a maximum of (11) long guns per section and includes (7) adjustable/removable shelves for additional storage options (1) Full length shelf – Width: 35 3/4″ Depth: 16 1/8″ (6) Small shelves – Width: 11″ Depth 16 1/8″ (These shelves can only be used in the right or left section of the gun rack.) LOCK FEATURES (Details) UL Listed LaGard Group II combination dial with pre-set random combination Top reading satin chrome dial with black numbers that features “VisionGard” See below for more details.